Even the most careful drivers can find themselves in emergency situations. A sudden tire blowout, a stuck accelerator, or even a patch of black ice can turn a peaceful commute into a complete disaster. 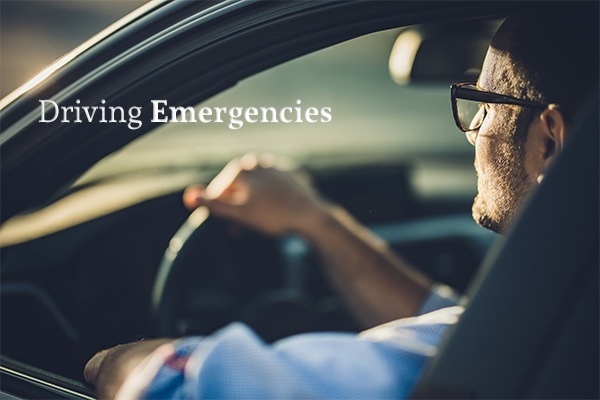 By being aware of a few of the most common driving emergencies and how to handle them, you’ll have a better chance of avoiding a serious vehicle accident. Experiencing a sudden tire blowout can be scary. Not only is the popping of the tire jolting, but you may not know what to do when you lose a tire. Should you speed up? Slow down? Believe it or not, your best course of action when your tire blows is probably the exact opposite of what your instincts will tell you to do. Your instincts will tell you to slow down and move to the side of the road—but if you’re traveling at any significant rate of speed, this can actually cause you to spin out and crash. The best thing to do is actually to keep your foot on the accelerator and keep driving your car straight. Because of the friction of the lost tire, your vehicle will naturally slow down. Once your car has coasted nearly to a stop, you can safely move over to the shoulder. Just be sure to turn on your hazard lights as soon as your tire blows so that you can alert other drivers to your situation. Black ice can be terrifying because it’s something you never see coming. If you don’t know how to react, your car could suddenly skid out of control and cause a serious accident. This is another situation where you may actually want to go against your instincts. Rather than slamming on your brakes and hoping that your car stops, you’ll actually want to take your foot off the accelerator and tap the brake pedal repeatedly and lightly. When your car skids, it’s generally your front wheels that have lost traction; if you slam on the brakes, you’ll just make the problem worse. By tapping your brakes, you may be able to help your front tires gain traction on the road again, thus allowing your vehicle to come to a stop. As your car is skidding, it’s also important to gradually steer your car in the direction of where you want your car to stop. No matter what speed you’re traveling at, a stuck accelerator can be frightening. Oftentimes, accelerators become stuck when a floor mat or shoe slides forward and gets lodged near the gas pedal, thus pressing and holding it down. In some cases, simply tapping the pedal a few times with your foot may be enough to dislodge whatever has gotten stuck and help you regain control. If this doesn’t work quickly, however, your best bet is to shift your vehicle into neutral. This will immediately kill the acceleration. As your car is in neutral and the gas pedal is stuck, your car will likely make some loud revving noises, but this isn’t going to hurt your engine, so don’t panic. Once your car is in neutral, begin tapping your brakes repeatedly and turn on your hazard lights until you’re able to slow down and pull off to the side of the road. Hopefully, you’ll never be in a situation where you encounter total brake failure. However, if your brakes do fail, every second will count, so you’ll want to make sure you know exactly what to do and what not to do in order to slow down safely. In some cases, brakes will fail due to loss of pressure. You may be able to re-establish that pressure by repeatedly pressing down on the brake pedal. If this doesn’t work but you still have some time to slow down, you can always shift your car into neutral and coast to a stop. Unfortunately, you won’t always have lots of time to come to a stop when your brakes fail. If you need to stop immediately, use your parking brake. The key is to pull down on it gently so as to avoid losing control of your car. As a last resort, you may also be able to slow your speed by guiding your car up against something such as a curb or guardrail. This will of course cause some damage to your car, and it’s not ideal by any means, but it’s better than getting into an accident with another vehicle or colliding with something head-on. Hopefully, you’ll never find yourself facing any of these driving emergencies. If you do, however, be sure to keep this advice in mind. And of course, if you’ve been involved in an auto accident in Abilene or the surrounding areas, turn to Juan Hernandez Law P.C. for the legal help you need. Juan Hernandez is board certified in personal injury law, which is a distinction only 2% of Texas attorneys can claim. Contact them today to set up your consultation; they’re conveniently located in the city of Abilene, with offices in Dallas and Amarillo as well.